Johann Hamza was a painter of genre who was born in Teltsch on 21 June 1850. He studied under Eduard Von Engerth at the Vienna Academy, and exhibited in Vienna, Dresden and Munich between 1879 and 1890. He died in 1927. We don’t have a lot of information about him, except that he specialized in genre painting. He liked to depict everyday life by portraying ordinary people in common activities. At a very early age he was already a consummate craftsman who conceived his pictures with a lot of detail. He was very precise depicting the surfaces of all the materials, objects, and figures. This painting is a good example. Jorge Luis Borges always imagined Paradise as some kind of library. It seems that perhaps Johann Hamza could agree with him, since libraries and books are common topics in his paintings. There are at least five works with the title In the Library, where different gentlemen are sitting reading in a library or a room full of books. Furthermore, some other works represent people reading, like An Old Man Reading, Reading for Pleasure, or Reading on the Terrace. 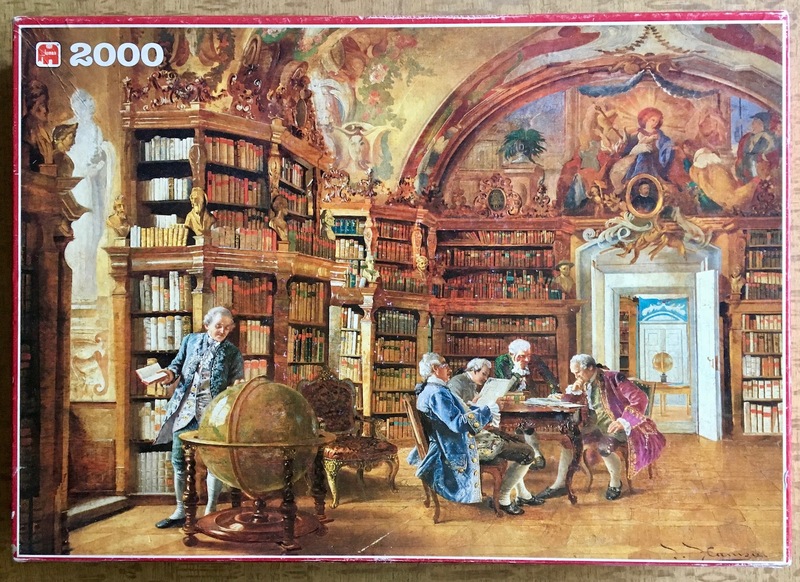 When someone loves books as much as jigsaw puzzles, this Jumbo puzzle is the perfect combination of two great hobbies. 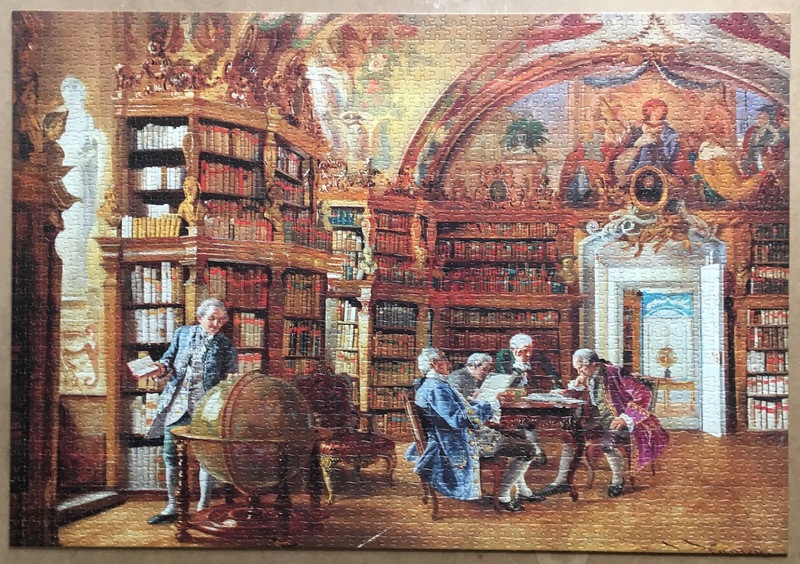 This puzzle was very nice and more challenging than I initially imagined, since there were too many similar pieces with book spines. However, it was not too difficult. Although the puzzle was not new, the quality of Jumbo pieces is very good, and it looked like new. I had two incomplete copies of this puzzle, but they were perfectly compatible, so I was able to put together a complete copy that I listed later at Rare Puzzles. There is an additional copy that will be used for replacements in the future. 2000, Jumbo, In the Library, Johann Hamza, 98 x 68 cm, Reference Number 1746.